A Sword and Sorcery story about the redemptive journey of a once cruel king to reclaim his identity. 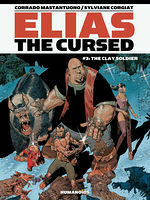 Fallen king Elias is on a quest to reclaim the face that was stolen from him by the mighty sorcerer Melchior. 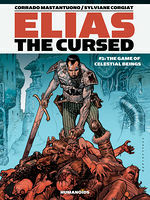 With the help of an unlikely gang, of all fantastical shapes and sizes, and amidst magic both good and evil, Elias The Cursed will attempt to save his face, and perhaps his soul. This book will entertain you as much as it will look good on the bookshelf. 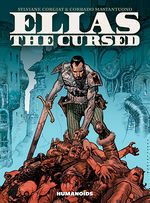 Whether you’re craving another sword and sorcery fix or you just want to read a solid non-American comic book, then you cannot go wrong with Elias The Cursed. This isn’t a case of Mastantuono just luring us in with the detail, though, as he packs every single page with images you can really study. 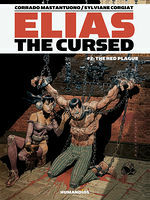 He brings to mind a slightly more decorative Jim Baikie or Joe Kubert, possessing a similar loose and scratchy style. 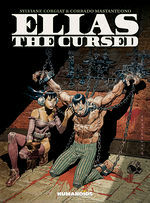 Elias the Cursed gives you the goosebumps that come with discovering your new favorite thing. 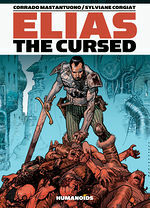 Corgiat puts Elias through the veritable wringer plus assorted other medieval torture/plot devices on his quest to obtain the 32 talismans, and of course obtain his reckoning with Melchior, in a tale told with as much humour as there is gore.